Protects sheep and cattle against clostridial diseases. POM-VPS. # In vitro toxin neutralisation test based on haemolysis of sheep erythrocytes. For a full list of excipients, see section “Pharmaceutical particulars”. Light brown aqueous suspension that settles on storage. Cattle and sheep from 2 weeks of age. For the active immunisation of sheep and cattle against diseases caused by Clostridium perfringens type A; C. perfringens type B; C. perfringens type C; C. perfringens type D; C. chauvoei; C. novyi type B; C. septicum; C. sordellii; C. haemolyticum and against tetanus caused by C. tetani. 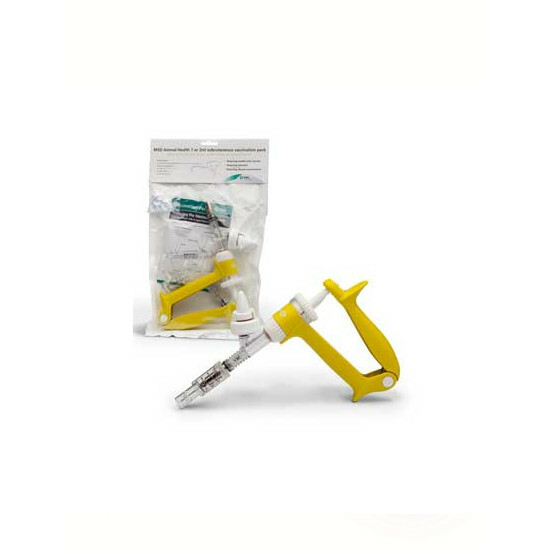 For the passive immunisation of lambs and calves against infection caused by the above mentioned clostridial species (except C. haemolyticum in sheep). An anamnestic humoral immune response (immunological memory) to all components was demonstrated 12 months following the primary course of vaccination. Sheep: 12 months against C. perfringens types A, B, C and D; C. novyi type B; C. sordellii and C. tetani. < 6 months against C. septicum; C. haemolyticum and C. chauvoei. Cattle: 12 months against C. tetani and C. perfringens type D.
< 12 months against C. perfringens types A, B and C.
< 6 months against C. novyi type B; C. septicum; C. sordellii; C. haemolyticum and C. chauvoei. For lambs: At least 2 weeks for C. septicum and C. chauvoei. at least 12 weeks for C. perfringens type A; C. perfringens type D; C. novyi type B; C. tetani and C. sordellii. No passive immunity was observed for C. haemolyticum. For calves: At least 2 weeks for C. sordellii and C. haemolyticum. at least 12 weeks for C. perfringens type A; C. perfringens type B; C. perfringens type C; C. perfringens type D; C. novyi type B and C. tetani. The effectiveness of the vaccine in providing passive immunity to young lambs and calves depends on these animals ingesting adequate amounts of colostrum on the first day of life. Clinical trials have demonstrated that the presence of maternal antibodies (MDA), particularly against C. tetani, C. novyi type B, C. perfringens type A (calves only), C. chauvoei (lambs only) and C. perfringens type D may reduce the antibody response to vaccination in young lambs and calves. Therefore, to ensure an optimal response in young animals with high levels of MDA, the primary vaccination should be delayed until the levels wane (which is after about 8-12 weeks of age, see section “Indications for use”). In the event of an anaphylactic reaction appropriate treatment such as adrenaline should be administered without delay. Do not vaccinate sick or immuno-deficient animals. 75 - 100% of animals vaccinated with Bravoxin 10 may experience reactions to vaccination. Most commonly reported adverse reactions are localised swelling or in duration at the injection site but may also include mild hyperthermia, abscess or other reaction in the underlying tissues at the injection site. Swelling at the injection site occurs in the majority of animals. This may reach up to a mean value of 6 cm in sheep and 15 cm diameter in cattle; occasionally reactions of up to 25 cm diameter may be seen in cattle. Most local reactions resolve within 3-6 weeks in sheep and in less than 10 weeks in cattle, but may persist longer in a minority of animals. An abscess may develop in some animals. Vaccination may give rise to reactions in the underlying tissues at the injection site. Skin discolouration at the injection site (which returns to normal as the local reaction resolved) may occur. Localised pain at the injection site for 1-2 days post first vaccination may occur. The local reactions do not affect the general health, demeanour, feeding or weight gain of the animals. No side effects other than those described in section “Adverse Reactions” were seen when the vaccine was used in sheep and cattle between 8 and 2 weeks prior to parturition. In the absence of specific data, the use of the vaccine is not recommended during the first or second third of pregnancy. Avoid stress in pregnant ewes and cows. No information is available on the compatibility of this vaccine with any other. Therefore the safety and efficacy of this product when used with any other (either when used on the same day or at different times) has not been demonstrated. Sheep – from 2 weeks of age: Dose - 1 ml. Cattle – from 2 weeks of age: Dose – 2 ml. Administration: By subcutaneous injection at a suitable site. The recommended site is the loose skin on the side of the neck. The bottle should be well shaken before any vaccine is withdrawn. Syringes and needles should be sterile before use and the injection should be made through an area of clean, dry skin taking precautions against contamination. Primary vaccination: Two doses should be administered, 4-6 weeks apart (see sections “Special warnings for each target species” and “Indications for use”). Booster vaccination: A single dose should be administered at 6 to 12 month intervals (see also section “Indications for use”). Use in pregnancy: To provide passive protection of the offspring, via the colostrum, a single booster dose should be administered between 8 and 2 weeks before parturition, provided that animals have received a full primary vaccination course before pregnancy. In calves and lambs, local reactions may increase slightly if twice the recommended dose is administered (refer to section “Adverse Reactions”). To stimulate active immunity in sheep and cattle against C. chauvoei and the toxins of Clostridium perfringens type A, C. perfringens type B, C. perfringens type C, C. perfringens type D, C. novyi, C. septicum, C. tetani, C. sordellii, and C. haemolyticum contained in the vaccine. To provide passive immunity via the colostrum against the above clostridial infections in young lambs and calves. Aluminium potassium sulphate (alum), Thiomersal, Formaldehyde and Sodium Chloride (0.85% solution). Do not mix with any other vaccine, immunological and veterinary medicinal products. Store and transport refrigerated (2°C - 8°C). Protect from light. Do not freeze. Cardboard box with 1 flexible low density polyethylene bottle of 20, 50 or 100 ml with a pharmaceutical grade rubber bung held in place with an aluminium seal. Not all pack sizes may be marketed. Below are some recent questions we've received regarding Intervet Bravoxin 10, including answers from our team. Is it just 1ml required to any size/weight of sheep/lamb? Yes thats right. 1ml for any sheep/lamb over 2 weeks old.